This coupling was predictable after SRCD 249 pairing the first two symphonies but this disc is even more successful than its predecessor. The Piano Concerto was written for Colin Horsley whose recording of the John Ireland concerto is on EMI Classics. The concerto is purposeful and sufficiently romantic to hold at bay the composer’s dangerous tendency to frivolity or Parisian cleverness that damages appreciation of the symphonies. In fact Berkeley finds here the sort of grandeur that makes his works of the 1930s and 1940s so attractive. David Wilde's playing was praised by the composer and we are fortunate to be able to hear it now. The cut-glass 1940s Rachmaninov-style romanticism is offset by Berkeley's lucidity of expression and orchestration. The middle movement cools the ardour, is hesitant, yet controlled and romantic rising to briefly scudding grey clouds at 5:29. The finale is gawky and angular, recalling the Ravel G minor and Rachmaninov's Fourth Piano Concerto. I am bound to muse: what would Arturo Benedetti-Michelangeli have made of this? We switch forces for the Two Piano Concerto and move a decade forward in time. It was premiered in 1958 by Sellick and Smith. Angularity is in the ascendant as is a modest dissonance of the sort encountered in Britten's Diversions. The work is in two movements: the first 8:01 the second 24 minutes comprising a Theme and (11) inventive Variations. It's just a pity that the variations were not separately banded. The theme shares elements of Bobby Shaftoe and the hymn tune Westminster Abbey. 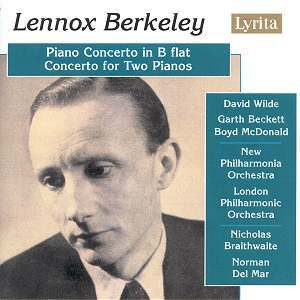 Berkeley's two piano concertos finely performed and recorded - the first a serious work; the second in the nature of a mercurial diversion.